The PlayStation Mouse, mouse mat and packaging. 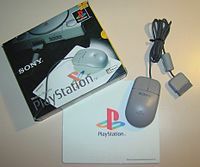 The PlayStation Mouse (US/UK: SCPH-1090, JP: SCPH-1030) is an input device for the PlayStation console that allows the player to use a mouse as a method of control in compatible games. The mouse was released in Japan on December 3, 1994, the launch date of the PlayStation. The mouse itself is a simple two-button ball mouse that plugs directly into the PlayStation controller port without adapters or conversions and is a fully supported Sony accessory. It was packaged along with a mouse mat bearing the PlayStation logo. The mouse is mainly of use to point and click adventures and other mouse-driven games to control the cursor. In later years, first-person shooters also make use of the peripheral to aim the player's view in the same manner as similar games on the PC. It is also used by the arcade lightgun shooting game Area 51 as an aiming device instead of GunCon compatibility. ^ "History of the PlayStation". IGN. Retrieved 24 January 2015. ^ "A Train". Next Generation. No. 4. Imagine Media. April 1995. p. 86. ^ "ProReview: Final Doom". GamePro. No. 98. IDG. November 1996. pp. 100–1. ^ "Review Crew: Horned Owl". Electronic Gaming Monthly. No. 84. Ziff Davis. July 1996. p. 28. ^ "Motherlode". Next Generation. No. 18. Imagine Media. June 1996. p. 114. ^ "Review Crew: SimCity 2000". Electronic Gaming Monthly. No. 85. Ziff Davis. August 1996. p. 24. ^ "Team EGM Box Scores: Virtual Pool". Electronic Gaming Monthly. No. 91. Ziff Davis. February 1997. p. 150. ^ "Xerox". Next Generation. No. 14. Imagine Media. February 1996. p. 158.